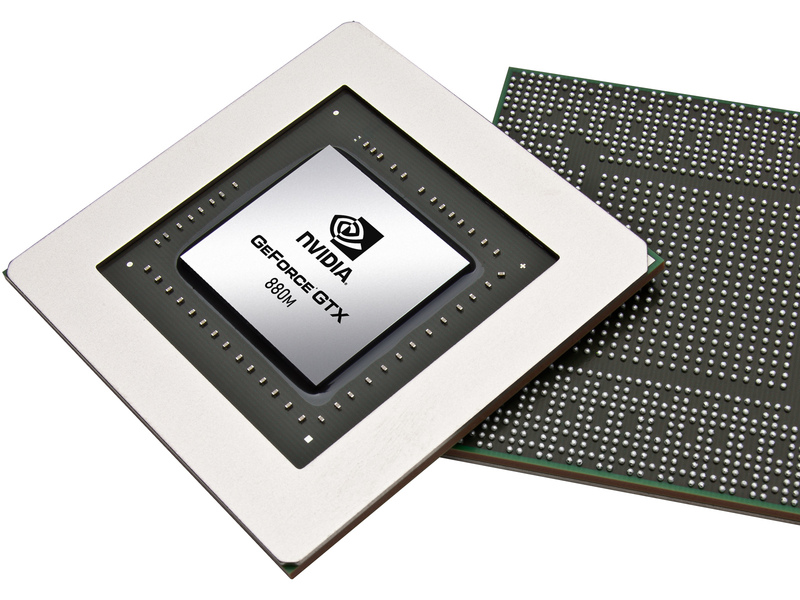 The NVIDIA GeForce GTX 880M is a high-end DirectX 12-compatible graphics card for laptops unveiled in March 2014. Similar to the GTX 780M, it is based on the 28 nm GK104 chip (Kepler architecture), but features a higher core clock rate. As of spring 2014, it is the fastest laptop graphics card on the market. The Kepler architecture is the successor to the Fermi architecture that first appeared in laptops with the GeForce 400M series. The GK104 Kepler core offers eight shader blocks, called SMX, that are clocked at the same speed as the central core. In the GTX 880M, all eight blocks are active for a total of 1536 CUDA cores and 128 TMUs. The chip can access up to 8 GB of GDDR5 memory connected via a 256-bit interface. Due to the higher core clock, the computing power has been increased by about 15 percent compared to the GeForce GTX 780M. However, the memory bandwidth stagnates, so the average performance gain is lessened. Our benchmarks show an increase of about 10 percent, making the GTX 880M the fastest mobile graphics card as of spring 2014. The GPU has enough power to run demanding games of 2013/2014 fluently with Full HD resolution and maxed out graphical settings. The feature set includes support for up to 4 active displays. Furthermore, high resolution monitors of up to 3840x2160 pixels can be connected using DisplayPort 1.2 or HDMI 1.4a (if available). HD-Audio codecs, such as Dolby TrueHD and DTS-HD, can be transmitted via bitstream mode through the HDMI port. However, as most laptops will feature Optimus, the integrated GPU will likely have direct control over the display ports and may limit the feature set available by the Nvidia Kepler cards. New features of the GTX 800M series include Battery Boost (longer battery life while playing games), Shadowplay (recording of in-game videos) and Game Stream (stream PC games on the Nvidia Shield console). The power consumption of the GeForce GTX 880M should be similar or slightly above the GTX 780M, leading to a TDP of more than 100 W. Therefore, only large desktop replacements can support the power demands of the GTX 880M.